After 6 weeks in ICU, I was well and truly medically stable. The only thing keeping me in ICU now was my locked jaw (and the need for a GA everyday to clean my teeth). Keeping me in ICU longer than necessary was bad for many reasons. ICU is often full and I was occupying a bed that was now unavailable for a critically ill patient. It also limited my access to more intensive rehabilitation. On top of that, it was a difficult ward for family to visit. So a facial surgeon was called in. He said he thought Botox was the best and least invasive treatment to try. The only possible side effects were on the muscles involved in speech and swallowing. That was irrelevant to me because mine weren’t working anyway! The effects of Botox only last 3 months anyway, so any side effects aren’t permanent. 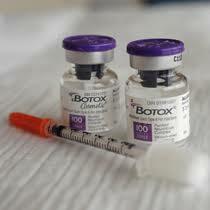 Botox was good news because we were thinking surgery might be needed. I must admit that I was a bit sceptical it would work after my first lot of Botox did nothing. This guy was apparently the ‘best’, so I had to have a little hope. I had 4 injections I think. I can remember the 2 in my temple vividly. The doctor told me the Botox needed to go just underneath the muscle. To find the right spot he told me he would put the needle in my temple till it touched bone and then pull it back just a fraction. It is very hard to describe the sensation. As the needle touched my skull, the sound of it scraping on the bone echoed through my head like it was being played on loud speaker. 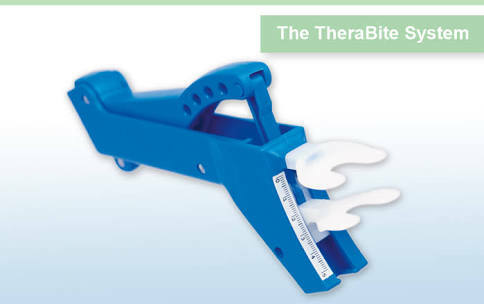 The surgeon also ordered a piece of equipment called a TheraBite. It came from Melbourne, which was the only one in the country at the time. 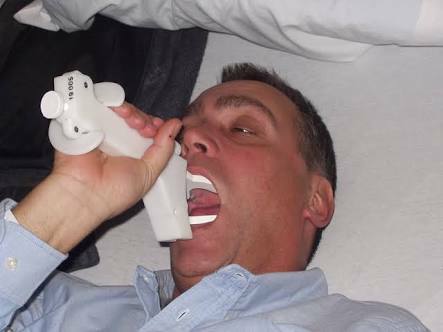 The TheraBite was a bizarre little contraption to stretch my jaw open. Two pads were placed between my teeth and a family member pushed on a lever forcing my jaw open. The jaw is the strongest muscle in the body. So although at times it felt like an object of torture to me, it was harder for the person trying to apply enough force to squeeze my jaw open. I took great pleasure in sharing the pain of my journey for 5 minutes each hour. These few minutes each hour also provided much entertainment for me. Bizarre facial expressions, swear words and strange dances on the spot by my family struggling to last the 5 minutes were all a regular part of TheraBite time. Over the next few days, my jaw started opening a couple of centimetres. My beautiful specialist was very excited and asked me to try mouthing some words. He was both happy and shocked as I managed to mouth my first word very clearly. It was a 4 letter word, rhyming with duck. Sorry Dr Tuck. My husband Steve is not conventional, nor does he obey most rules. He decided it would be fun to give me small amounts of water now that my jaw was opening a little. He got his hands on a small plastic syringe in ICU. He would squirt just a few millilitres at a time onto the back of my tongue. This would set off my swallow reflex and I would swallow the water without any problems. We knew that this was silly and the risk of aspirating fluid into my lungs was high, but still we persisted like naughty little children. In retrospect I’m not sure why we did it. For me, having even a small amount of liquid in my throat after 6 or 7 weeks felt great. Maybe for Steve it was comforting to have me doing something ‘normal’. Then again, it is possible he simply enjoyed breaking the rules. With my jaw opening a little wider each day, it became clear that I would soon be leaving ICU. I knew it was a positive step in terms of recovery, but ICU had been my home since this nightmare began. I knew the ICU staff well now and I trusted them. I was so vulnerable but I knew I was safe here. So as the days passed, I became increasingly nervous about what would come next. Steph You are a constant source of wonderment to me & my family. Small everyday obstacles are now not so important as I think of you & your “mountains” yo9u have climbed. Paul has just returned to Mexico after being home a few days but will return for Christmas with his little Aly, & Dale of course. You are inspiring and funny!